Photo available for download for publicity purposes. Megan is the author of, The Sock Thief which was included in The Creative Kids Tales Story Collection Vol. 1 in 2017, and An Angel to Watch Over Them in the anthology Three Dummies in a Dinghy and Other Stories of Life in 2018. Raymund and the Fear Monster is her debut picture book and will be released in 2019. Megan has always been an avid reader of books from all genres, but she especially enjoys sci-fi and fantasy. As a child and teenager, if she could have combined reading from horseback while galloping along Mackay’s beaches, or while mustering cattle in the Queensland outback she would have. (Of course, she would have not enjoyed the thrill of adventure if she’d had her head in a book). Megan has always written stories. However, it is only within the last five years that she started calling herself a writer. She loves to encourage children to read, and write their own stories. 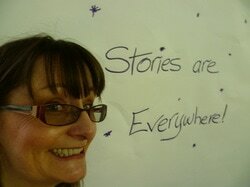 She loves to share her own stories, and encouraging children to create their own stories, and have fun doing it. On the 26th February, I was interviewed on Gippsland FM. We chatted about the Street Libraries project I'm involved in, the stories I've written, my book, 'Raymund and the Fear Monster' coming out soon, reading and writing. It was lots of fun. And all this on little sleep and severe brain fog. All in all the interview went pretty well. It must have. They invited me back. ​Woohoo! My first interview as an author...and it was with Romi Sharp from JustKidLit.com. Yay! Thanks Romi for inviting me to be part of your 'Interview by Theme.' So much fun! If you want to find out more about why I do what I do, and a deeper look into what drives me, I am the featured emerging author on Creative Kids Tales for February 2017. You can read the interview here. Michelle Worthington from Share Your Story Australia interviewed me about my writing, my lifelong love of books, my struggles with dyslexia, and much more in, 'The Importance of Community with Megan Higginson'. Creative Kids Tales and Just Write For Kids .